Q. I'm freaking out! I finally talked my wife into letting me buy several hundred tulip, daffodil and crocus bulbs this fall to plant in the perennial garden that I've created in our backyard. 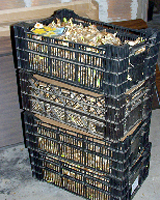 However, I still have more than a hundred bulbs to get into the ground! Can I plant them through the snow? Or, should I just bite the bullet and toss them into the compost pile? A. Believe me when I say that I've been in your position - many times! The good news is that you have several options - even this late in the year. To maintain marital harmony, the first option would be to wade on out into the snow and cold and get those bulbs into the ground ASAP! To speed the process along, keep in mind that there's absolutely no need to go through all the bulb planting contortions you may have read about in gardening books and magazines including double digging, incorporation of compost and bone meal, spacing bulbs precisely with global positioning systems, etc. Rather, having the experience of designing and overseeing the installation of landscapes and gardens containing well over a hundred thousand bulbs during the past several years, my tools of choice are a flat slab of steel welded onto heavy gauge bar with handles for large bulbs (tulips, daffodils, ornamental onions, etc.) and narrow trowels for small bulbs (grape hyacinth, crocus, snowdrops, aconite, etc. ), above left. The one tool we don't use is a bulb planter, at right in the picture, because it just doesn't work in clay and rock-strewn soils! Just jam either of these tools, or the corner of a small shovel/spade into the ground, rock it back and forth to create a slit large enough for the particular bulb or corm that you're planting, stick it into the ground and close the slit by kicking it in with the heal of your boot. Using this rather crude technique, you can easily plant your remaining bulbs in less than an hour! A second option would be to set five daffodil and five tulip bulbs in the bottom of a ten-inch diameter pot, cover them with peatmoss-based potting soil (e.g., Pro-Mix, Jiffy-Mix, etc. ), then add a layer of ten to twenty crocus and grape hyacinth bulbs and cover them with potting soil, too. Set the pots out in your garage, unheated porch, etc., for a month or so, then start bringing in a pot or two each week, water them well, and set them in a bright, warm room. Two to four weeks later, you'll enjoy a taste of spring as the bulbs begin to bloom! 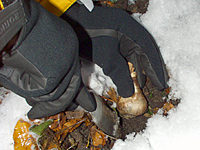 Finally, your third and probably least acceptable option to your wife, would be to keep your remaining bulbs in a cool (ideally at almost refrigerated temperatures and certainly below 50 degrees), dark location and get them into the ground just as soon as the snow melts during our traditional mid-winter thaw!